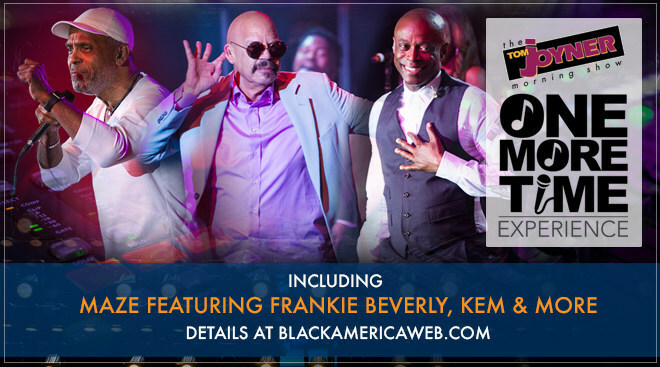 Tom Joyner presents the One More Time Experience tour, a series of unforgettable evenings of live music and performances celebrating 25 years of the Tom Joyner Morning Show. The tour launches in May and will feature artists including Maze featuring Frankie Beverly, KEM and more. In making the announcement, Tom Joyner offered "What better way to say thank you to the people I owe my career to! I hope everyone will be as excited as I am to celebrate with good music, good fun and good hugs! We have 25 years worth of partying to achieve, so let's do it together, with the ultimate One More Time Experience!" Joyner - who first gained popularity after earning his nickname "The Fly Jock" while flying round-trip between Dallas and Chicago for seven years and eight million miles - hosted morning and afternoon shows in two different cities. Joyner revolutionized radio, becoming the first morning show with music in syndication launching January 3rd 1994. Joyner announced that he would retire from broadcasting in December of 2019, capping one of the greatest careers in communications.